A sad day for human rights and the rule of law, following news that the Georgia Board of Pardons and Paroles denied Troy Davis clemency. This means that, in the words of Laura Moye, Death Penalty Abolition Campaign Director at Amnesty International USA, "... very little is standing in the way of the state of Georgia executing a potentially innocent man this Wednesday, September 21st at 7pm." The denial of clemency by the Board follows weeks of rigorous campaigning by human rights groups and individuals of goodwill to stop the execution due to "too much doubt" in the Troy Davis case. Amnesty International USA alone collected and delivered more that 650,000 petition signatures to the Georgian Board of Pardons and Paroles on Thursday, 15 September 2011. According to Amnesty International USA, almost 1million signatures were collected from other organizations seeking to stop the execution. Troy was convicted in 1991 for murder of a police officer. There was no physical evidence linking him to the crime. The murder weapon was not found and there was no DNA evidence. The conviction was handed down based on eyewitness accounts. However, seven out of the nine eyewitnesses have retracted their accounts, with some saying they were coerced by the police to testify against Troy. So much doubt surround the conviction. 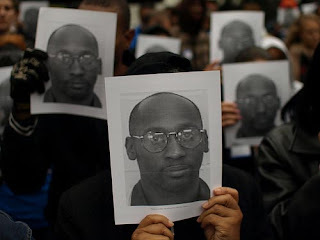 It is a shame that the Board of Pardons and Paroles have ignored the loud voices of millions of people around the world who see something wrong with the looming execution of Troy Davis. Considering the fact that Troy was convicted based on eyewitness accounts and many of the eyewitnesses have recanted, there is a high possibility that Troy is innocent. It therefore follows that the state of Georgia could execute an innocent man. Although close to a million petitions were ignored by the Board, we cannot give up - only one day to the execution date. Please, join Amnesty International USA in calling on the Board to reconsider its decision and on the Savannah District Attorney to do the right thing. Troy Davis has survived three previous execution dates because those who oppose his execution refused to give up on him. Help stop the September 21st execution. "It is with a very heavy heart and a deep sense of outrage that we let you know that the Georgia Board of Pardons and Paroles voted to deny clemency to Troy Davis. The action of the Board are astounding in the face of so much doubt." - Amnesty International USA, Facebook status update, 20.9.2011. *Photo of "I'm Troy Davis" vigil: Foreign Policy Association. *Photo of Troy Davis Petitions: Amnesty International USA.